In an effort to reduce the amount of time spent in a cruise control installation, Rostra is pleased to announce a replacement cruise control for item number 250-1876. 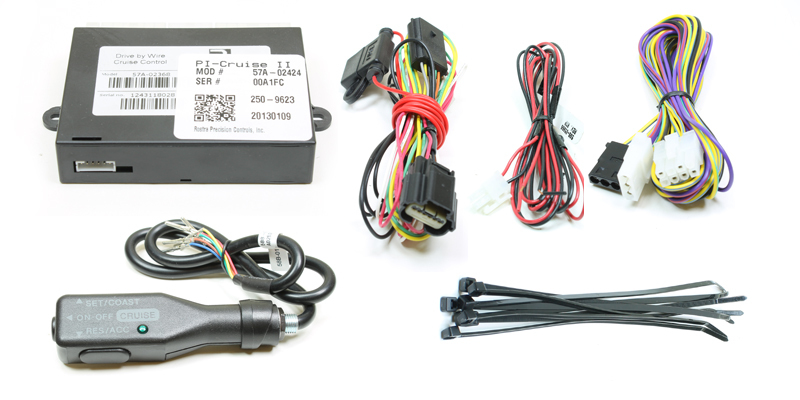 The newly-released cruise control system will use part number 250-9623 and includes enhancements such as a custom-fit pedal interface harness, pre-programmed vehicle-specific cruise control module, left-hand mount control switch with On/Off LED indicator, and fewer electrical connections necessary to complete an installation. No dealer activation is required and installers will benefit by having to make only power and ground connections on the vehicle (outlined in the instructions) in order for the unit to operate. This cruise control has been validated on the 2012 Dodge Ram 1500 only. Please see the complete system below and feel free to call our customer service department at 1-800-782-3379, or contact us online by clicking here. A full color product installation manual is available online by clicking here. Download this announcement as a PDF by clicking here. Rostra is a leading manufacturer of automotive parts and accessories including customized and universal electronic aftermarket cruise control systems, automotive parking assists, exterior vehicle camera systems, automotive lumbar supports, seat massagers and seat heaters, as well as transmission wiring harness and linear solenoid production. Dodge Ram is registered trademark of Chrysler Group LLC.